Prominent & Leading Manufacturer from Ahmedabad, we offer semi automatic bottle washing machine and four head air jet cleaning machine. An experienced team of professionals assists us manufacture and supply an excellent array of Semi Automatic Bottle Washing Machine. Compact and highly efficient, this machine is used to wash containers of glass, plastic or other material. 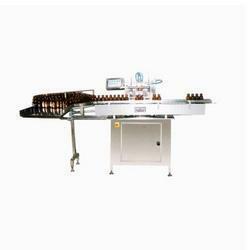 This machine operates on the Rotary principle with 'GENEVA' mechanism and requires manual loading and unloading of bottles. Clients can avail this machine from us at highly competitive price. Four internal, one external and one air wash. Washing Sequences and positioning of washing stations can be interchanged as required for liquid oral & injectable. Stationary nozzles eliminate contamination of water cycles. The specially designed cups are provided on the platform to accommodate any size of Bottle from 100 ml to 500 ml. Easy loading and unloading with two rows. Individual solenoid valve for each washing sequence. Pumps and tanks are mounted on parable stand for easy maintenance. This machine is used for the Cleaning of the bottle of all sorts. Output/Hour 2600 to 6000 Nos. & 4300 to 9000 Nos. We are recognized as the leading manufacturer and supplier of superior quality Four Head Air Jet Cleaning Machine. Manufactured using top quality raw material in adherence with the international standards, this machine is engineered with high level of precision the help of latest technology by our experts. This machine is available in different technical specifications as per the specific requirements of clients. Power 0.75HP, 415 Volts Ac , 3, Phase, Neutral, 50 Hz.